From tracking your steps, to responding to messages and even learning about your daily stress patterns, smartwatches make the perfect travel accessory. 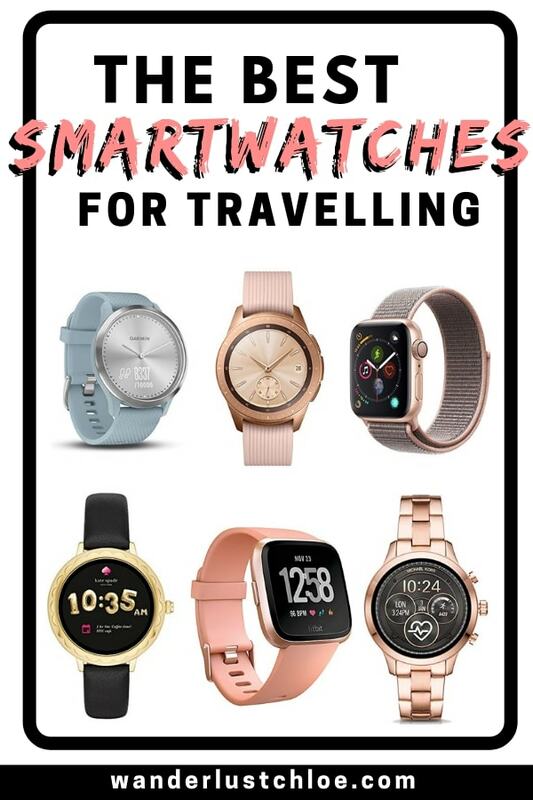 Find out which to choose in my ultimate guide to the best women’s smartwatches for travelling. Forget just telling the time, these days smartwatches can do so much more! They can count your steps, track your stress levels, play music, respond to emails and more. Wow have they come a long way in just a few years. I remember the first smartwatches were clunky and had too few features to justify the high prices. It’s funny looking at the evolution of smartwatches on Probrand’s recent post – who knew they’d become such a desirable accessory? 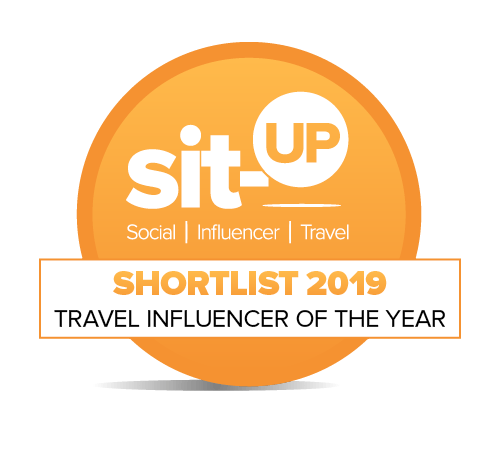 While they’re useful day to day, there are plenty of great features for travel lover like me. It’s fun being able to keep an eye on how many steps you’ve done. It’s useful being able to pay with your wrist, rather than carrying cards around. 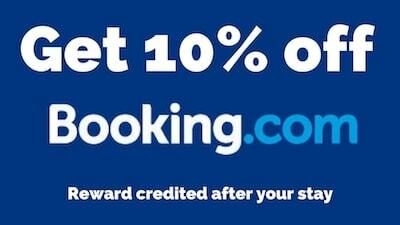 Hey, you can even pop your boarding pass on it! Plus I love how you can do quick replies to people without having to get your phone out – particularly useful if you’re travelling to riskier destinations. 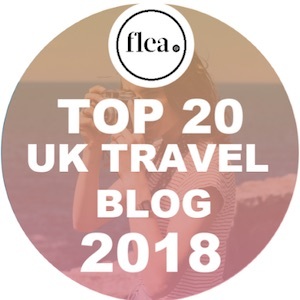 While there are plenty to choose from these days, these are my 2018 top picks of the best women’s smartwatches for travelling. One of my favourite things about this smartwatch is how stylish it is. While some feature digital screens, this one has real watch hands which show the time. When you want to use the extra features, swipe the time away and you can reach your steps, calories, heart rate monitor, messages and music. The Garmin Vívomove HR smartwatch is perfect for people wanting to understand their bodies better. It has advanced sleep monitoring to track how much time you spend in each level of sleep. Plus, it monitors your daily stress levels. With strap options in every colour of the rainbow, you could order a few different ones and then it’s guaranteed to complement your outfit! 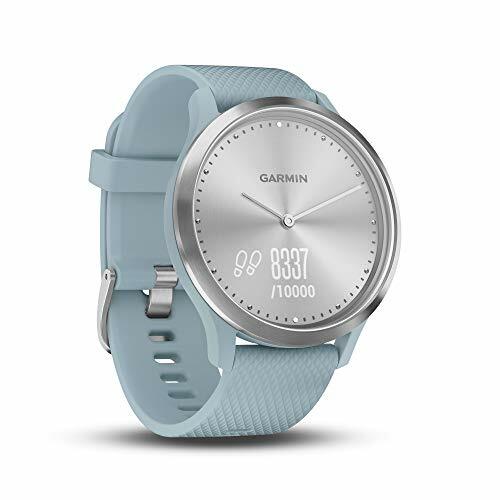 Find out more about the Garmin Vívomove HR smartwatch and check latest prices. Lots of people wear Fitbits already, but the Fitbit Versa smartwatch is perfect for active sorts who want lots of features, while being able to track their movements in detail. 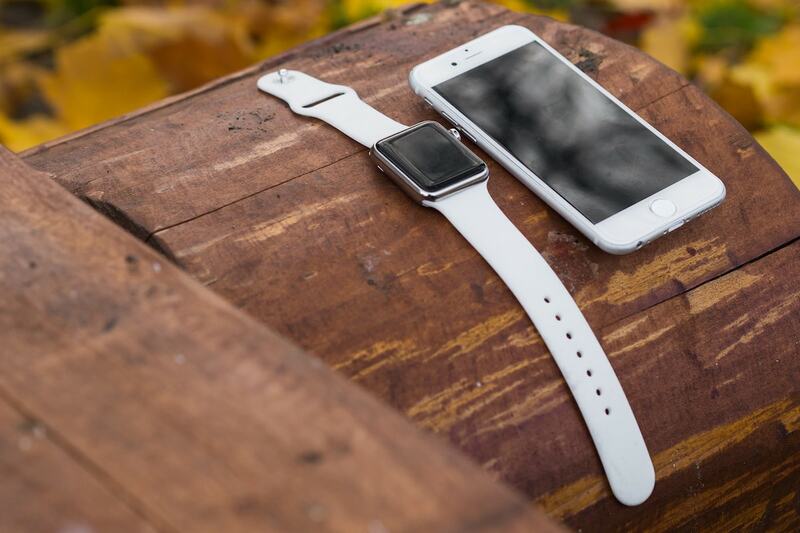 The watch is much smaller than the previous version, and has the ability to store over 300 songs. It constantly tracks things like steps and heart rate, plus it’s water resistant up to 50m – perfect for swimming and water sports! It’s also designed to show your notifications and reply to messages on the go. It has a range of clock faces (download from the app store) so you can customise it to your favourite colours, designs and more. 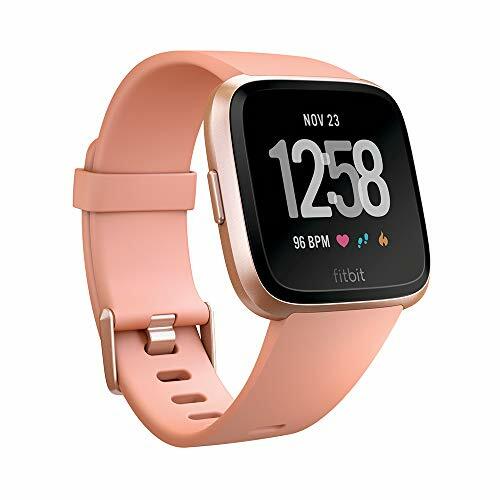 Find out more about the Fitbit Versa smartwatch and check latest prices. If you own an iPhone you may be swayed to this one by your Apple loyalty anyway! The Apple Watch Series 4 is one of the larger options around at the moment (particularly when you compare it to the Apple Watch 3) but it’s full of functionality. Check your emails, review your notifications, play music and sync with all your Apple devices too. It’s also waterproof, has built-in GPS and it can make calls when you’re away from your phone. In terms of design, it’s definitely a smartwatch rather than a pretty fashion accessory! It’s digital rather than delicate, but there are plenty of cute straps to choose from to jazz it up a little. Find out more about the Apple Watch Series 4 and check latest prices. 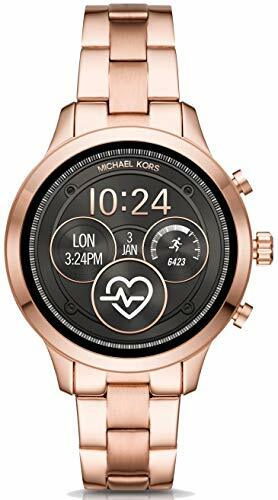 Released in 2018, the Michael Kors Sofie smartwatch is one of the most stylish around right now. In terms of functionality it works with standard apps, you can use it to check messages, plus it’s fitted with Google pay so you can tap your watch for contactless payments. If you’re an active sort, you can use it to track your heart rate, plus it’s fine to wear swimming. You can choose from stainless steel and leather straps, plus there are some chic Michael Kors watch faces too! Find out more about the Michael Kors Sofie smartwatch and check latest prices. The latest Android offering, the Samsung Galaxy Watch, is one of my favourites at the moment. It’s stylish, has a really good screen and plenty of functionality. Along with the standard notifications and apps you can also track your sleep, stress levels, up to 40 types of exercise and plenty more. It’s waterproof too, perfect for any adventures you have planned. 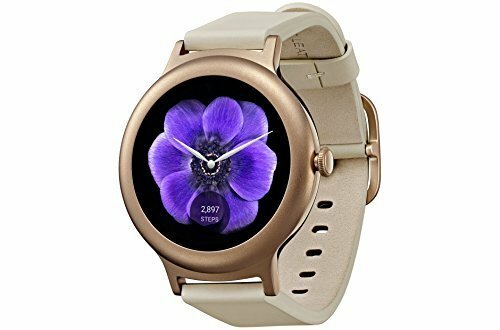 While there are a few options out there, I really like the rose gold smartwatch – cute, girly but still super functional. Oh and you can use Samsung Pay for contactless payments, meaning you don’t need to carry your phone or wallet all the time. Find out more about the Samsung Galaxy smartwatch and check latest prices. If you’re finding a lot of the options so far a little cumbersome, then this might be the smartwatch you’ve been looking for! Created by Skagen, who make lovely, classy watches in general (in my opinion!) 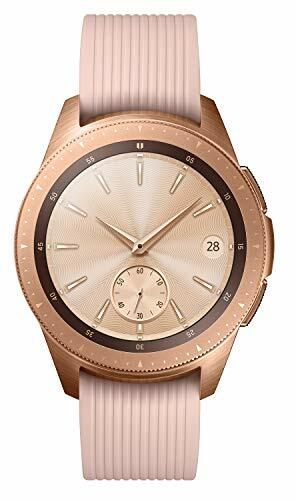 this smartwatch is dainty, with a clear display and a variety of different straps on offer, including recycled woven, brown leather and rose mesh. It has plenty of the features of the others including being swimproof, tracking heart rate, activities and showing notifications. It’s also fitted with Google Pay so you can tap anywhere that accepts contactless payments. Find out more about the Skagen Falster 2 smartwatch and check latest prices. The Fossil Q hybrid smartwatch is another that fits into the slim and simple category. It’s also one of the cheapest smartwatches around at the moment. Once connected to the Fossil Q app you can monitor your exercise and sleep patterns. It has good battery life, so you won’t have to charge it as much as many in this smartwatch guide. One of my favourite things are that it has a few buttons on the right which you can customise to do different things. The most useful is the ability to snap a selfie, meaning you can set up your phone somewhere and avoid the awkward arm / big face issues of the past! 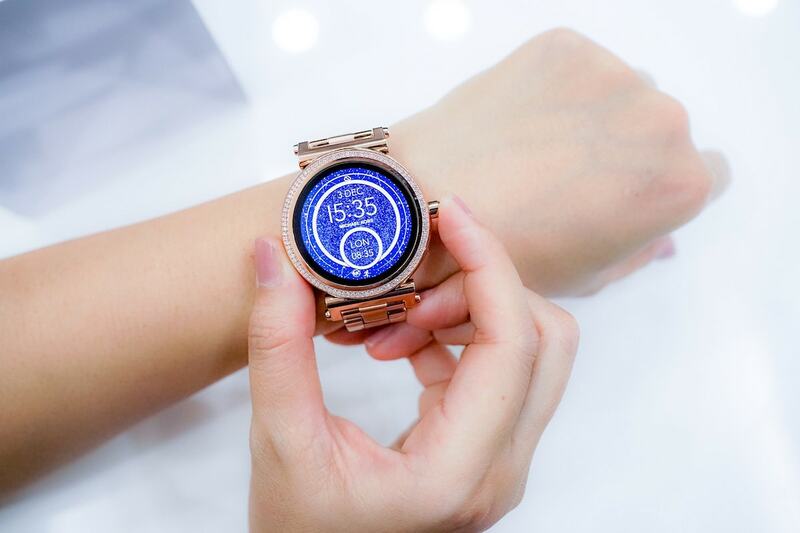 Find out more about the Fossil Q smartwatch and check latest prices. Michael Kors isn’t the only designer dabbling in the smartwatch world. Kate Spade’s first smartwatch is one of the mmost stylish smartwatches around right now. There are several cute faces to choose from, so you really can customise your watch to your outfit. Plus, it features the signature Kate Spade scallop design around the edge. In terms of functionality, it has all the usual features including notifications, fitness tracking and various apps you can connect to. 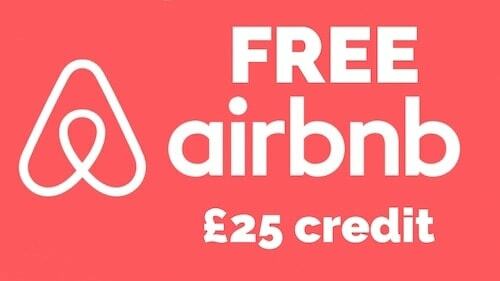 Sadly it doesn’t offer contactless payments, but that’s not something everyone is looking for just yet. 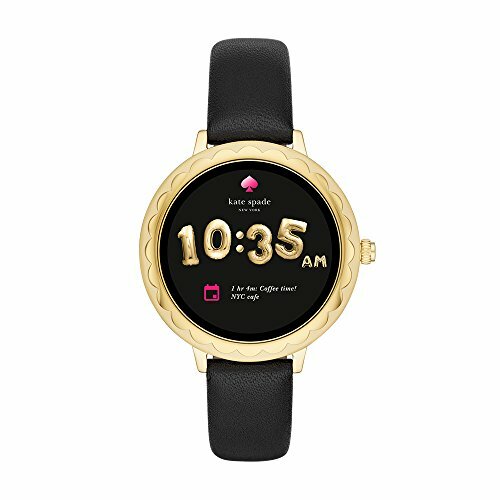 Find out more about the Kate Spade New York Scallop smartwatch and check latest prices. This is one of the smallest smartwatches around right now, which I know some women will find very appealing. 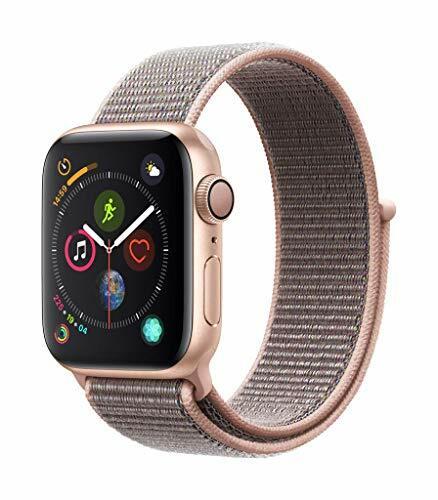 It comes in three colours (rose gold, titanium and silver), features a genuine Italian Leather Watchband and a rotating side button for simple navigation. It also has the Google Assistant built-in so you can say “Ok Google” to get quick tasks done on the go! Find out more about the LG Watch Style smartwatch and check latest prices. I hope you’ve enjoyed my guide to buying the perfect smartwatch for travelling! Let me know which is your fave.